I had planned to do another story today, but my laptop, sick of endless David Attenborough DVDs, Skyrim and searches of birding in South Africa made a break for it and took a swan dive off my bed. The resulting damage to the screen means that I am exiled back to my very ancient desktop. And my lack of backups (yes, yes, I know) mean that for the moment my recent photos are trapped, at least until I get off my bum and get the damn thing fixed. By a happy coincidence my Dad emailed me and told me how much he enjoyed my article last week on unpleasant viral pandemics and sent me some actually decent photos of the cave I spoke about in it that I hadn’t managed to take. So let’s revisit that while I consider the 300 dollars its going to take to fix my damn laptop. 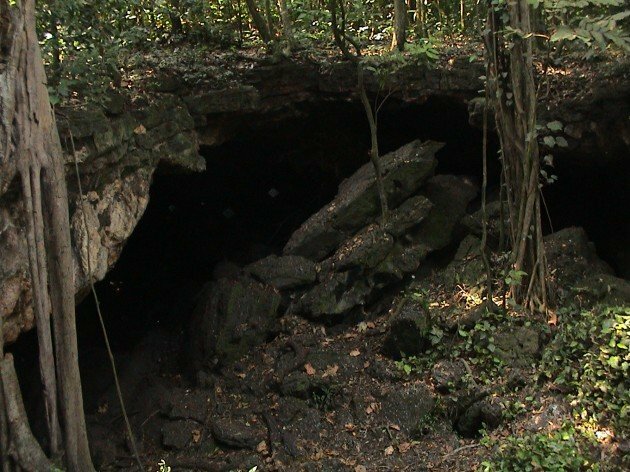 The Python Caves, as you’ll recall since you certainly read my article (and in some cases actually did, and even told me so and bought the book!) 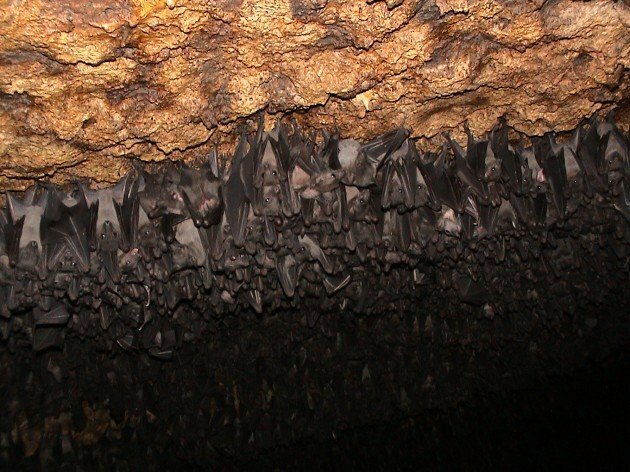 were the site which the nasty hemorrhagic fever Marburg jumped from Egyptian Fruit Bats to some unlucky tourists visiting the caves. 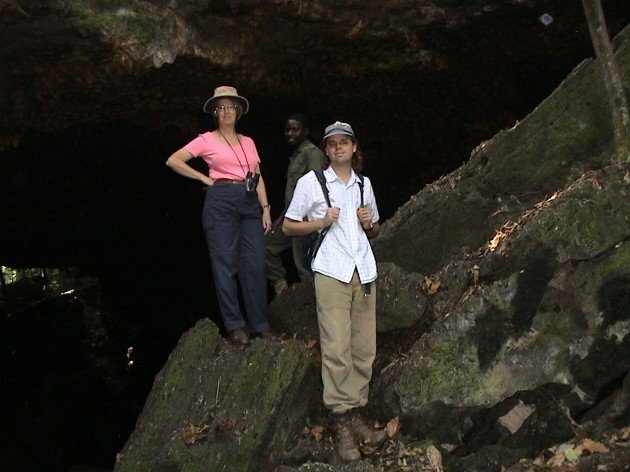 You’ll also remember that the caves are also one of the destinations I took my parents to when we toured Uganda. My mother certainly hasn’t forgotten that, I can tell you. Luckily, we didn’t enter the caves (you may recall this wouldn’t bother me any), but merely regarded them from the outside, which is why we never actually saw any of the large pythons that live there, growing fat on the bats, and also perhaps why the connection between the caves and this nasty virus wasn’t made sooner. 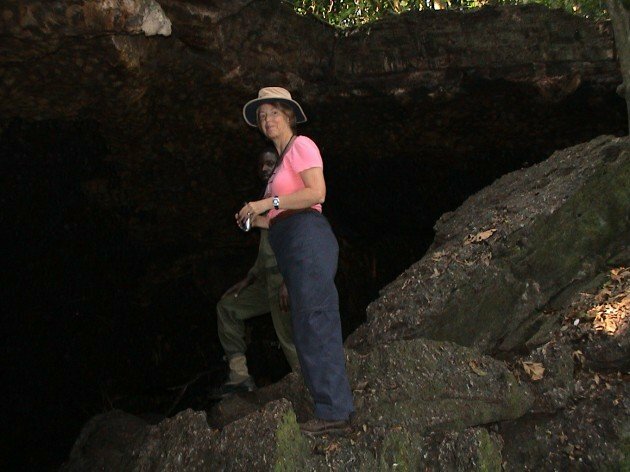 The caves are located in the southern area of the large Queen Elizabeth National Park. The park is one of the more spectacular in Africa, and long overdue a comprehensive post here. 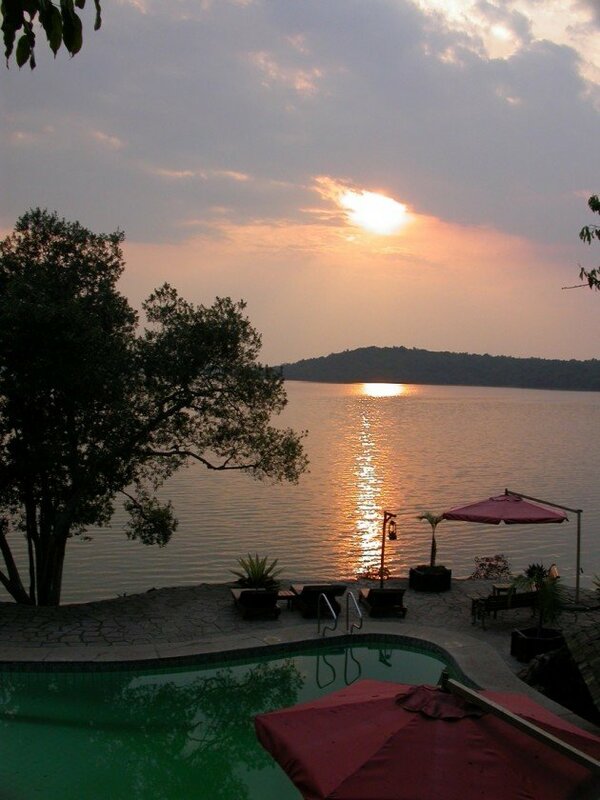 We were staying at the Jacana Lodge, a posh lodge perched on a small lake, as it was a convenient layover between the more touristy northern part of the park and the forest park of Bwindi (home to the gorillas). Unlike the northern part of the park, which is a mosaic of bushland and open savanna, the landscape around Jacana Lodge is dominated by the Maramagambo Forest. This means it has different species, and adds to the biological diversity of the park. It’s one of the few places in East Africa were you’ll see a Shining-blue Kingfisher, and absolute jewel of a bird that was my highlight of the trip (other than, in retrospect, not getting a nasty relative of Ebola). I also picked up a number of interesting lifers, including Sharpe’s Starling, a Red-tailed Antthrush, a small Grey-backed Camaroptera, a Speckled Tinkerbird (a type of barbet) and what my notes describe as a Mountain Greenbul but based on some recent splits would probably be an Olive-breasted Mountain Greenbul (a nice simple and short name). The latter species is now nearly an Albertine endemic, as the region of western Uganda, Rwanda, Burundi and eastern DR Congo is an area high in interesting endemics. And then there’s the bats. And for all that I am playing with how dangerous these bats are, the fact is they probably aren’t. Or rather, they aren’t much more dangerous than fruit bats anywhere else. Bats, it seems, are the reservoir of many zoonoses that cause humans, and other creatures, so many issues. Hendra, a nasty Australian virus, spread to humans and horses from fruit bats, as have other diseases elsewhere. 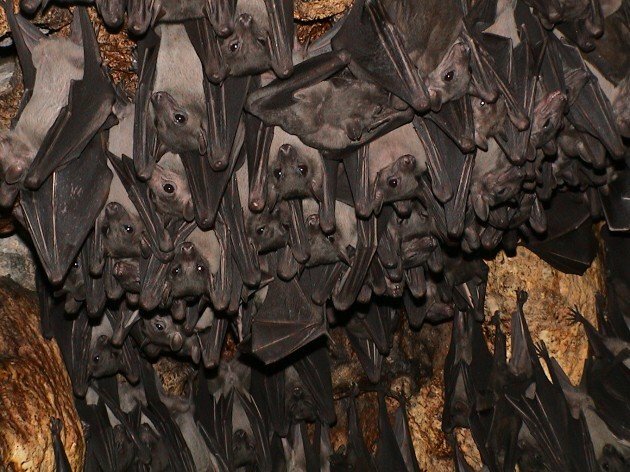 Ebola is wisely suspected of being a bat virus that spreads to humans, but the actual wild natural host is as yet unknown. 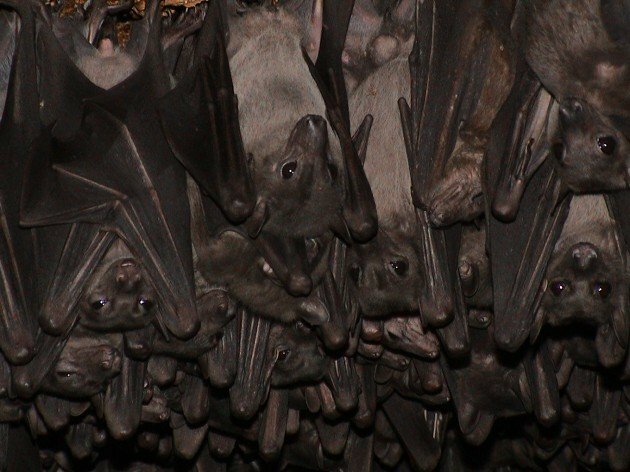 No one is sure quite why bats host so many dangerous diseases; it may simply be that they don’t, only there are lots of them in close proximity to us (not unlike rats). Still, it’s nice to mentally spend some more time back in Maramagambo, one of the many great places I visited while living in Uganda.Next time I go I’ll pack a better camera. Jacana Lodge is a pretty idilic location. All images save that last one belong to my Dad, not me. Tell you dad “great bat cave photographs!” Hope the laptop is fixed and/or your photos have been recovered.